In a drive to improve reliability, Earthmill Maintenance have been working together with Natural Generation and monitoring specialists Turner Iceni to develop a tailored condition monitoring system for Endurance wind installations. The new system was tested on 25 turbines is now being installed in every turbine in Earthmill Maintenance’s own fleet as well as a growing number of customers who have opted to adopt CMS. CMS pre-empts issues allowing our engineers to address them before they occur, significantly reducing downtime and repair costs. 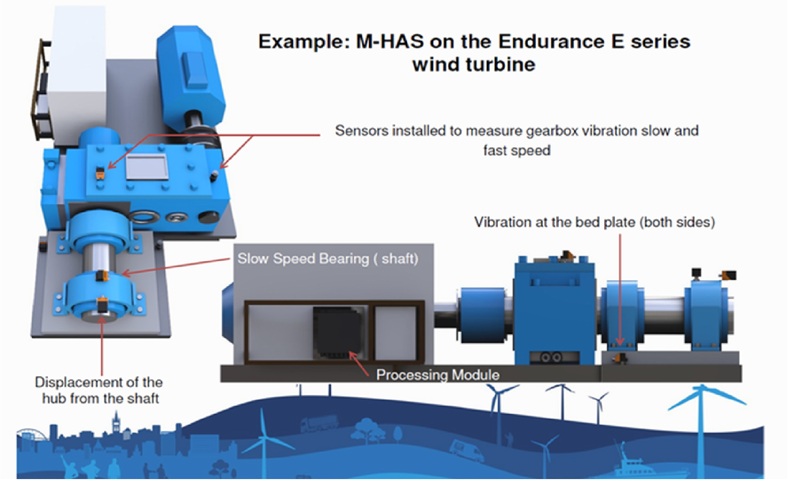 The condition monitoring systems that are more often seen in ‘big wind’ installations, comprise of a number of sensors placed inside the turbine nacelle which measure vibrations, noise and alignment as well as monitor oil for quality and contamination. Programmed algorithms identify and provide early warning of irregularities that if not addressed, could lead to issues such as spring tube failure, hub slip, bed plate cracks and gearbox or drive coupling failure. By identifying the symptoms of technical issues before breakdown or failures occur, repair costs and loss of generation are significantly reduced. The system has been integrated into a traffic light system on the WindSync dashboard with a live data feed so that turbine owners and the Earthmill Maintenance operations team are able to monitor the health of the machine and be alerted of irregularities ahead of major any problems. At the point of installation only labour (approx 1 day) is charged to fit the condition monitoring system. The cost of the sensors used is then spread out across 60 monthly payments. As an Earthmill Maintenance client, you already pay for remote monitoring and therefore the additional visibility of your machines health that CMS provides will be monitored by our operations team as a part of your standard service and maintenance package. Condition monitoring is available to Earthmill Maintenance clients now.